For a unique wedding experience beneath the warm summer sun, with the blue sea curling on to the crisp white sand, wedding dreams can turn to reality at a private bay at Taiharuru. With the ceremony on the beach and the reception in a marquee on the lawn side the beach this coastal destination will make your special day a truly memorable occasion. Davies Bay is just 30 minutes from Whangarei and is surrounded by 800 acres of lush green farm land. The access to the beach and parking make it suitable for all generations. This beautiful secluded beach boasts a selection of accommodation to comfortably sleep 24 wedding guests, more can stay and enjoy the romantic setting by camping around the properties serviced by a separate ablution block. This part of the country possess magnificent panoramic sea views from elevated hill top positions above the beach which will provide your wedding photos a perfect back drop that is hard to beat. In order to have the Entire Bay for your intimate wedding experience, it is necessary to book the following 3 properties on the beach. Pending your chosen property to centre your wedding at, an extra day before and after your wedding celebration is generally required, to erect and dismantle the marquee. It is therefore necessary to book that property extra time to accommodate this. 4-5 days is advisable. The recommended properties are The Hideaway and Bluebach, due to the flat areas of land. 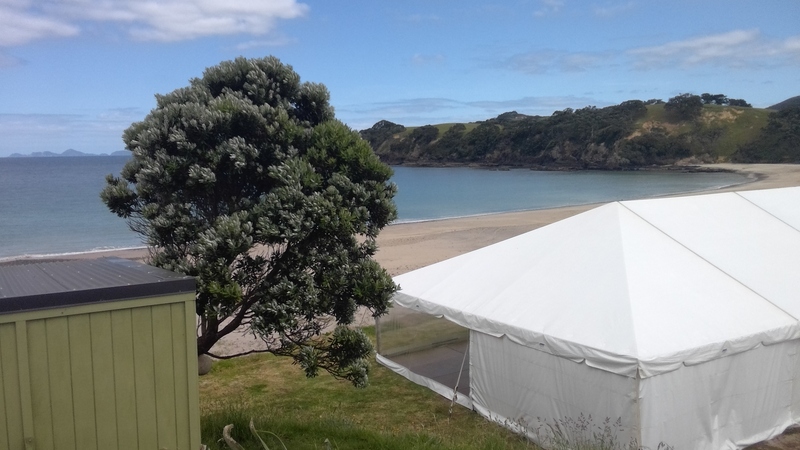 Additional cost to use the Davies Bay for the wedding venue is $2000.00 plus a $500 bond that is returned if the property is well respected and left the way it was found. This is based on, 100 guests or less. Additional accommodation options are also available, please discuss your requirements with us. Costs NOT covered in the venue fee include- hire of the marquee and setting up, compressor for power, additional refrigeration for beverages, ablution services, rubbish and recycling removal, catering and cleaning up. All costs subject to change. We welcome weddings of up to 150 guests. Our 3 closest properties can acommodate 24 people with additional accommodation close by and camping options available also. Please just let us know your requirements.